THE COMPLETE ANGLER by Izaak Walton and Charles Cotton in 2 Vols. 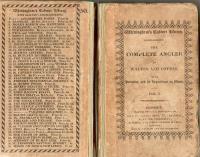 The Complete Angler in two volumes from Whittingham's Cabinet Library dated 1826. Both volumes have portraits and there are 32 engravings on wood. They were printed in Chiswick by C & C Whittingham. Sold by Thomas Tegg, Bowdery & Kirby and R. Griffin (Glasgow). Vol. 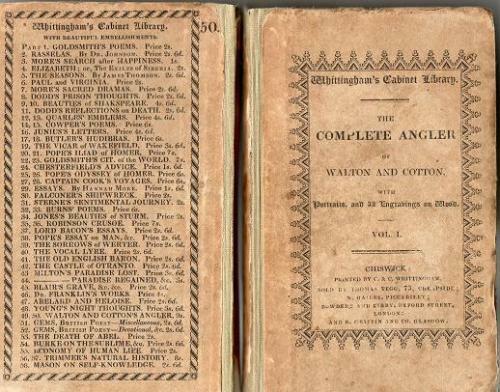 I contains the life of Walton followed by The Complete Angler while Vol. II continues the Complete Angler and concludes with notes about various fishing matters, including the laws of fishing and the Appendices. Both copies have been rebound and are 140mm x 90mm. The covers and spine have been relaid and are browned and bumped with age but both remain attractive little books. The rear of the covers have lists of other books in the Whittingham Cabinet Library. Internally the books are sound and generally clean.